The Apple iPhone can do many things. Add "saving a life" to that long list. Last Monday, a student at California State University, Fresno was returning to his apartment at around 11pm when a mugger pulled out a gun and grabbed his computer bag from behind. A struggle ensued and the gun went off. 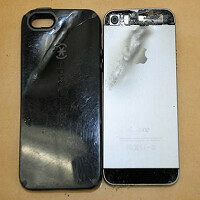 Luckily for the 24-year old victim, the bullet bounced off of his iPhone, saving his life. The student did not want to be identified since the mugger remains at large. The student's roommate told the local press that the victim was shaken up. "The jeans was tore and he showed me his iPhone ... and I saw the bullet was really clear on it. So it saved his life," the roommate told NBC affiliate KSEE. The victim has left the school and does not plan on returning. This is hardly the first story about a smartphone saving a life by deflecting a bullet. Last August a Samsung Galaxy Mega 6.3 took a bullet for its owner. Other handsets that paid the ultimate price to save a human life include a BlackBerry, a Nokia Lumia 520 that saved a cop, and an HTC EVO 3D that saved its owner's life. It is actually quite a disturbing trend, and quite scary to think that your life can be spared only because you decided to put your phone in a specific pocket. This just might be the article of the day, as far as comments go. Hella cool that the guy lived. What was the bore of the bullet. I guess .177 bore pellet may be shot from an Air Gun............................ The one which is used to burst balloons and eggs. Don't know, but I'm glad he's alive and well. That's all that really matters. Not against the iPhone but I think the case+phone combo actually saved him. I also think the shot came from the side scratched it and ricochet off. But what didn't make sense was "... and I saw the bullet was really clear on it", there is no hole for the bullet to stay intact, if he meant that literally. I'm not even concerned with the phone issue bro, that's for the fanboys. It's just cool that the guy survived, and made it home to his family. I hate senseless violence, and am glad he lived. A Galaxy would have exploded instead, causing more serious damage to the victim ROFL. That's not funny, and you're not Rolling On Floor Laughing. You're so predictable.http://www.digitaltrends.com/mobile/galaxy-note-2-saves-cop/ Samsung gave him a brand new phone too. yeah because Galaxy Note 2 is bulky as hell man. that thing is huge, heavy, and thick! BobbyBuster you have reached a new low even by your standards. You're a disgrace to Apple/iPhone fans. Galaxy phone did save policeman long ago , ignorat. Go google it. The Apple propaganda is too late again. http://www.theregister.co.uk/2013/10/30/florida_robbery/ HTC's were bulletproof years ago. and this one took a direct hit and actually stopped a bullet... not deflected one coming at an angle. Survived the deadly bullet to his jeans? Same story happened with Samsung phone long ago. So where is the news here??? ok he lived dont really care about that lots of humans on earth but i think if he did not have the phone it would have went past the leg maybe a scrap, but its almost 90% spigen case that stopped / slowed the projectile. lesson learnt: don't go to california. Again? Btw, the right title for this news should be: "Stupid student risks his life to save his iphone". How about you read the article. I've got a feeling this has a lot to do with the plastic speck case too, as the phone alone might not be able to stop the bullet. Polymers are much better at stopping bullets than metal as they can stretch and can pull off much higher elastic force, easily stopping a bullet. While metal would just bend and break. I must say "It was a weak gun". Should that matter, or should him living matter? Nobody dies if shot by a pellet gun. Although shot right in the eye then there are chances of some serious casualties.. I am amazed that folks are missing the big picture. Thanks for trying to remind them. The guy would have been dead and burning if the phone was Galaxy Note 5!